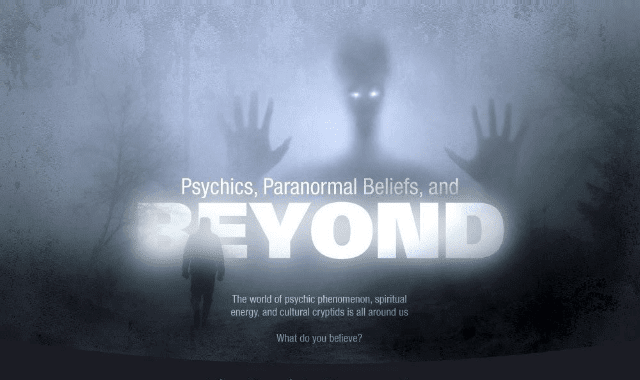 Paranormal and Beyond #Infographic ~ Visualistan '+g+"
Do you believe in psychic healing, haunted houses, or paranormal beings? If you’re a skeptic, it might shock you know how many people believe in the supernatural. More than half of Americans believe in psychic phenomena and most people who actually visit a psychic believe that they were truthful. Yet just 14% of all people believe psychics a true ability to see the future or contact the dead. For those who believe, psychics have documented ability to heal. Visiting a psychic can help people overcome emotional distress by validating their feelings, helping them to accept a loss, and revealing hope for the future. Psychic healing can even reduce sensations of pain or discomfort, but it only works if you believe. Belief in the supernatural doesn’t end with private citizens. The CIA once ran a program to discover if remote viewing could provide a tactical advantage against our enemies. They used psychics to attempt to determine the best targets, technical capabilities, and locations of our enemies. The Men Who Stare At Goats, was actually based on this real program. The world is full of strange and paranormal phenomenon. Some of want to explore the supernatural, while other dismiss it. What do you believe?